The comfortable La Belle Tortue lodge on Silhouette island is completely surrounded by a tropical garden and lush vegetation, ensuring a level of peace and privacy that allows guests to fully enjoy their exclusive holiday in the Seychelles. In a sheltered sandy cove on Silhouette Island, in close proximity to an old wharf, and Pointe Varreur. 7 living-units spread across different categories (Lodge Room, Varangue Room, Anne Dieu-le-Veut Villa, Suite, Private Villa). Double bed, air-conditioning, hotel safe, free WiFi (only in lounge area), cable TV, Italian bathroom with shower, minibar, balcony or terrace (features vary slightly depending on room category). La Belle Tortue is an exclusive lodge located in a sheltered sandy cove on Silhouette Island, protected from the open ocean by a coral reef. The excellent year-round climate and ease-of-access from the main island of Mahé are both real highlights of the accommodation. In fact, in this location, it's almost as if time stands still, it's so beautiful. The completely untouched nature of this uniquely-beautiful island ensures a luxurious feel to the lodge's surroundings. The locals even believe that Silhouette best represents the true essence of the Seychelles, so why not immerse yourself in the stunning surroundings that will relax your body, mind, and soul? Silhouette, the third-largest Seychelles island, has been left as much as possible to nature. The island is really just a single mountain, Mount Dauban, that slopes steeply down into the Indian Ocean, with nothing but the sandy beaches of its coastline to separate the sea from the lush rainforest interior of the island. La Belle Tortue lodge is located on one of these beaches, offering a truly private location for the limited number of people who can reside on the island at the same time. In addition, there are numerous other beaches of varying sizes to explore. For those who want more than just beaches, there's much to discover all over the island. The island's paths may be a little 'wild' for some people, but they cut through the vegetation, leading you to various secluded spots on the island. (For more information regarding hiking paths see 'Activities and Specials'). On Silhouette there is something unique to see around every corner: rare tropical plants, cedar trees, the short-tailed bat, or mini-chameleons. Giant tortoises can also be found, as can the spectacular beaches we've already talked about. The whole island was designated a national park more than twenty years ago, and its really this natural beauty that's the main draw of the island. The inviting Belle Tortue was designed in a Creole style, with the aim of making guests feel right at home upon arrival. Visitors can spend many relaxing hours on the ocean-view veranda, soaking up the peaceful atmosphere of the island. The rooms and villas of the lodge offer plenty of peace and privacy, perfect for a family holiday, a romantic getaway, or a solo vacation. The hotel's managers aim to create an easygoing, carefree atmosphere for their guests. Over the course of the day, you'll have the choice between total relaxation, the peace and quiet of the library, or refreshing cocktails at the bar or on the terrace. The cosy lounge almost acts like a family living room, allowing guests to wile away the hours chatting to each other, discussing plans for their holiday, swapping pictures over the free WiFi, or simply relaxing after a busy day of exploring. Guests can also choose to have a game of Scrabble, Backgammon, or even Monopoly, before heading to the restaurant, which serves up a delicious combination of local and international cuisine, lovingly prepared with fresh, local fish, fruit, and veg produce by the kitchen staff. The chef is always happy to serve up a stunning three-course set menu. On top of all that, the lodge offers numerous activities and things to do so guests will never be bored. Why not take a trip around the national park, or get up-close and personal with the giant tortoises? Plunge into the crystal-clear waters of the Indian Ocean or discover numerous fascinating animals. Diving or fishing trips, snorkelling excursions and sunset tours (to book ahead) on the open sea are all available, before heading back to the lodge to let the day fade out into your memory. *Guests are required to reach the jetty 30 minutes prior to the scheduled departure time of the boat in order to complete check-in formalities. *Boat schedule subject to change without prior notice. Absolute privacy: there is only ever a maximum of fifteen people staying at La Belle Tortue throughout the year. Enjoy close proximity to the fine, sandy beach. Discover Silhouette Island on-foot! The island offers a number of different hiking trails to the island's beaches. In terms of simple routes, La Passe (5 minutes), Anse Cimitière (15 minutes), Anse Lascars (30 minutes) and Anse Patates (1 hour) are all reached with ease on-foot. Baie des Cipailles (40 minutes) is another easy-to-reach beach, although bays such as Anse Mondon (2 hours; great for snorkelling) and Jardin Marron (1 hour 45 minutes) are much harder to get to. The path to Grand Barbe (3 hours) shouldn't be attempted without a local guide accompanying you, as the path itself isn't easy to find. In addition, after the 1 hour 30 minute mark, you will lose phone signal. Furthermore, a tour of Anse Marron and Grand Barbe is not to be recommended if it is raining, as the granite boulders can become extremely slippery. See the hiking map for more information. Clients also have the extra option of booking the Aldabra Suite with a home cinema system and a selection of DVDs to help keep them entertained during their stay. Clients can also watch their own films that they have stored on their hard drive, but movie downloads or streaming are not available due to the island's internet connection. First shuttle boat connection from La Belle Tortue runs at 11 a.m. Private boat or helicopter transfer can be arranged (as an extra) to depart from 7 a.m. onwards. - Guests who are booked onto an early flight from Mahé at 08.15 a.m. are advised to book their last night's accommodation on Mahé in order to ensure they don't miss their flight, or, alternatively, to book a later flight. The Creole restaurant of the Belle Tortue is located on the small island of Silhouette, and offers a beautiful view of the ocean. The French head chef serves up different three-course menus on a daily basis, based on seasonal ingredients and whatever fish stocks are available on the day. For lunchtime, the restaurant also offers light salads, fresh fruits, and can also provide a picnic basket on request for a beautiful beach day or excursion. Tastefully-furnished, high-quality rooms create a truly welcoming Creole atmosphere. The ocean view is really extraordinary, and is typical of the peaceful, private feel of this luxurious property. First-floor bedroom, set up for two adults. Double bedroom, air-conditioning, safe, cable TV, Italian bathroom with shower, minibar, balcony facing the beach. Ground-floor bedroom (accessed via stairs), and is set up for two adults and a baby. Double bedroom, air-conditioning, safe, cable TV, WiFi (free of charge), bathroom with shower, separate WC, minibar, terrace facing the beach with two sunloungers, lounge-area. Bedroom, bathroom, and balcony on the first floor, indoor and outdoor lounge on the ground floor (accessed via stairs), set up for two adults, 2 children and a baby (convertible sofa). Double bedroom, air-conditioning, safe, cable TV, WiFi (free of charge), Italian bathroom with shower, WC, minibar, Nespresso coffee machine, terrace facing the beach with sunloungers, lounge area, four-poster bed, balcony with sea-view and two armchairs. 1 Varangue Room with lounge on the ground floor, double bedroom, sleeping area with two large and comfortable sofas which can be converted into 1 sofa bed (for 1 adult or 2 children), air-conditioning, fan, safe, Italian bathroom with shower, separate WC, minibar, cosy indoor lounge, cable TV, WiFi (free of charge), home cinema in the lounge with a selection of DVDs, terrace facing the beach with two sunloungers and lounge area. 1 Varangue Room with lounge on the ground floor, double bedroom, sleeping area with two comfortable sofas which can be converted into two sofa beds (for 2 adults or 2 children), air-conditioning, fan, safe, Italian bathroom with shower, separate WC, minibar, cosy indoor lounge, cable TV, WiFi (free of charge), terrace facing the beach with two sunloungers and lounge area. 2 adjoined Varangue bedrooms, set up for four adults, two children under 12, and a baby. Double bedroom, sleeping area for two children on a sofa-bed, air-conditioning, fan, safe, home-cinema, WiFi (free of charge), cosy indoor lounge, Italian bathroom with shower, separate WC, minibar, family dining table in private dining room, terrace facing the beach, with four sunloungers and two lounge areas. Babies and Children up to 2 yrs: 30 €. Children up to 11 yrs: 90 € plus 100% on board. Children up to 17 yrs: 125 € plus 100% on board. Children up to 17 yrs and Adults: 125 € plus 100% on board. Christmas: Compulsory supplement for the special dinner on December 25th - €30/guest over 8 years old. New Year's Eve: Compulsory supplement for the special dinner on December 31st - €50/guest over 8 years old. *Coach transfer return (about 30 minutes): Airport Mahé - Bel Ombre Jetty - Airport Mahé 45€/person. Please note: The first guaranteed shuttle transfer to Mahé from La Belle Tortue is at 11am each day. The hotel offers no connections for early international flight departures. 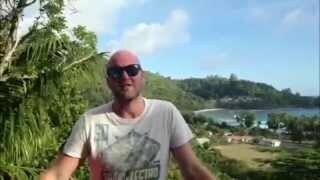 Booking for Guesthouse "La Belle Tortue"